Lucile was born in Layton, Utah the oldest child of Lionel Isaac and Bessie Bea Hadlock Layton. 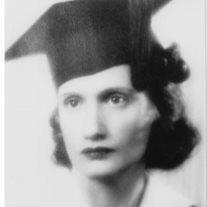 She graduated from Davis High School and then Brigham Young University in 1940. She often spoke of the difficulties and financial stresses her family faced because of the Great Depression. She was only able to finish college because she was lucky enough to find a job. After college she taught in the public schools. She always took money home to help her parents and younger brothers and sisters. During World War II, while she was teaching high school, she supported the war effort after school hours by driving a fork lift at Hill Air Force Base, Utah. During the war she met Oscar Trost who served in North Africa and Italy. They were married in September 1944. This marriage was later solemnized in the Salt Lake Temple. A daughter, Cathy (Wiggins) was born in 1945 and a son, Hal (Trost) in 1949. Oscar entered college on the GI bill. He graduated with a degree in Wildlife Biology and the young family moved to northern New Mexico where Oscar worked at a fish hatchery. After a very happy year and a half in New Mexico, Oscar was diagnosed with leukemia. He died in early 1954. Lucile then became a single parent with two small children to support. She returned to graduate school to earn a masters and then a PhD. She eventually became a college professor teaching at San Jose State, the University of Alaska and Brigham Young University. In 1973 she reconnected with Bland Giddings. They had known each other in college. Each had gone their way, married, had children, and lost spouses. After a whirlwind romance they married in August of 1973. Lucile moved to Mesa, Arizona to be with Bland, where she lived the rest of her 96 years. Bland and Lucile loved and supported each other until Bland’s death in 2012 after nearly 40 years of marriage. Lucile loved to travel, visiting Russia five or six times. Her son and daughter accompanied her to France and Italy. She and Bland took cruises to Australia, Greece and Turkey. Lucile also loved animals including Bland’s beloved geese and frequently adopted stray cats and dogs. Bland’s son Val Giddings gave her the only grandchildren, Naomi and Calvin. Bland’s other son, Tom Giddings is the only one of the four children who lives in Mesa, Arizona. He has been a great support and comfort to Lucile in the last few years of her life. Memorial services will be held June 27, 2014, 11AM, Harris 2nd Ward, 1455 North Harris Drive, Mesa, Arizona and on June 30, 2014, 11AM, Northridge Stake Center, 2375 E. 3225 N, Layton, Utah. If you wish to make a memorial gift, please consider a donation in her name to your local public television station or to the Humane Society.